Continue chatting at discounted prices! We are more than happy to announce that we are extending our Special 50% OFF Offer for Live and Video Chats! These two services have become really popular among our clients. That is why we were pleased to reduce the prices for Live Chat and Video Chat. Pay half, but chat twice as long! Do not miss the chance to enjoy our head-spinning offer! All Online ladies on our site are open for communication and ready to share their emotions and feelings in real time. Double your chances for finding your match! We are more than happy to introduce a stunning lady Anna from Donetsk, Ukraine. She is really an interesting person with a strong character. She is special because of her rich inner world. She decided to let you know about her main passions in life. Read her story and enjoy watching her unique photos and a free video here! We are pleased to announce our Hot Offer: we have reduced the prices for Live Chat and Video Chat! Pay half, but chat twice as long! Now, you have a very unique opportunity to experience our great Chat discounts. Double your chances for successful communication: share emotions, express your feelings, and spend more time enjoying conversations with your lady. Do not miss the advantage of trying this cost-effective offer, and you’ll see you’ll benefit! Enjoy every minute of your communication! Browse Online Ladies now! 1. Only verified profiles All of the ladies on our site are real and we provide every customer with reliable and authoritative information about the ladies in our database. Before a profile is listed in our female catalogue, each lady undergoes a double check... Read. We are happy to introduce a splendid single lady Alisa from Lugansk, Ukraine. She possesses a versatile personality and a deep thoughtful soul. As many other single ladies she dreams of finding her soul mate. And she is one of numerous beautiful women who deserves to be loved and happy. Alisa is pleased to share her thoughts with you revealing her intimate ideas and dreams. See her exclusive interview and photos here. BeHappy Intl is one of the most popular online dating networks and for many years now has been helping Western men to find their soul mates. We have an extensive experience in matchmaking Western men with foreign women. Our dating agency enables customers to find Russian, Ukrainian, Asian, and Latin brides in our female catalogues. Recently we have noticed a trend emerge, it seems that Asian brides are becoming increasingly popular among Western men. This piqued our curiosity and so we decided to find out what really attracts Western men to Asian women. We conducted an opinion poll among some of our customers, with around 5,000 people taking part. We asked our customers to state the main reasons why they decided to look for an Asian wife. Their overwhelming response was that Asian women possess certain qualities that Western women do not have, but that appeal to Western men. You are welcome to learn more about these qualities here. We are pleased to introduce a wonderful lady Irina from Nikolaev, Ukraine. Irina possesses a charming and romantic nature. She impresses everybody with her ability to look at the surrounding world. She decided to tell you a little story from her life which will help you to reveal these wonderful tiny strings of her soul. Read the story and enjoy her exclusive pictures here! Using French perfumes, wearing a Swiss watch and Italian shoes, driving Japanese cars, watching American movies and… having a Russian wife. No surprise! That is a life of excellence! It’s no secret that Behappy2Day brings people together. New ways of communicating are connecting people all over the world. We are excited about our new services, which have been improved and are now more customer friendly. Live Chat has become a favorite pastime! You can now play games while you chat! Due to popular demand, we’ve added Tic-Tac-Toe to Live Chat to give you a new, fun way to reach out to that special someone. Take a look at our client testimonials! Read what everyone has to say about our latest innovation, and then see for yourself how Live Chat brings people together. Hurry! Log on and enjoy our new and improved Live Chat Service with Online Games! The 8th of March is an International women’s day which is widely celebrated in Russia and Ukraine. It is supposed to be one of the most significant holidays for Russian and Ukrainian women. You are welcome to find out more about this holiday at our 8th of March page. You should remember that it is the very beginning of spring and the time when women want to feel special and loved. It is the most appropriate time to show your affection surprising your lady with a special gift. Flowers and chocolates are the order of the day to let her know how much you care. We are also glad to suggest you multiple options to congratulate your lady on International women’s day. You may send her a congratulatory letter, make her a call with the help of our phone-call service, send her a real or a virtual gift using our gift delivery service, congratulate her personally using a video chat. Choose the most suitable option for you and do not miss your chance to show respect, appreciation and love towards your lady. Chinese New Year and Spring Festival are coming! Let us please remind you that Chinese New Year (February, 10) and fabulous Chinese Spring Festival are coming soon! The Spring Festival that lasts for a week, February 08 – February 15, 2013, is the most significant festival for Chinese people, just like Christmas for western people. For celebration, all family members in China get together; those people who live far from home always find a way to go back home for spending Chinese New Year and Spring Festival with family and close people and friends. Everybody is waiting for their most secret dreams to come true! It is a tradition for Chinese people to exchange gifts during Spring Festival, thus any Chinese lady would happy to get attention from the man she loves and is devoted to, from the one she is thinking of days and nights! We kindly remind you not to forget to spoil your favorite Chinese lady with a special gift for Chinese New Year and Spring Festival! You are welcome to choose a gift for your Chinese Princess from our Gift Gallery here. Any kind of a gift will be appreciated by a Chinese lady. Valentine's Day is coming on February 14! On this day people around the globe want to express their love and innermost feelings to their loved ones. Ladies put a lot of significance on this holiday and wait to receive gratifying signs of attention. Make an unforgettable impression to a lady by sending her flowers and chocolates with a note on this special day. You can place your order by clicking on "Send a Gift" link in the lady's profile or by clicking on in your "Favorite Ladies" page. We’ve updated our Flowers & Gift Delivery Service and included ST. VALENTINE’S SPECIALS for your convenience. We would appreciate if you order in advance so we can arrange the delivery on time! Thank you! We are glad to introduce a gorgeous lady Julia from Nikolaev. She is a nice lady who is proud of her origins and her roots. Julia is not afraid of sharing her intimate life moments with you. She is a great example of a really courageous lady. She is happy to reveal some more facts about her life. You have a great chance to learn a bit more about this splendid lady than her profile tells you. See her exclusive interview and photos here. We are glad to introduce a beautiful lady Kristina from Odessa, Ukraine. Kristina is a brilliant example of an active person. She is an optimistic and open lady. She decided to tell you the story of how sports help her to live in this life. Sport was the thing that built many traits of her character. See her exclusive interview and photos here. We are glad to introduce you a beautiful and sportive lady Marina from Nikolaev. Marina presents a brilliant combination of beauty and health in one body. She knows how to be attractive. She decided to let her into her life telling you the ideas about her lifestyle. You will be also pleased to learn more about her life. Marina decided to share her sacred dreams with you. Read her story and enjoy her extra photos here! Christmas holidays are coming. It’s the most wonderful and mysterious time when all of your dreams might come true! We wish all our clients a Merry Christmas and a Happy New Year! Thousands of the gorgeous ladies at our site send you their warm greetings and wish you to make all your dreams come true! It’s a Christmas tradition to exchange gifts to show your love and care. We love our customers and are eager to present them with our special offer which will help them to meet their soul-mates. Hurry to make use of our present to realize your lady’s dream of seeing you in person. Our special Christmas sets will help you to let her know how much you care! BeHappy2Day is pleased to present you more video clips of our Ladies. As you know many ladies at BeHappy2day.com have video clips in their profiles. We are glad to announce that a new portion of 27 fresh video presentations was added to our catalogue. Enjoy watching more videos at our site now! As a rule profile videos help you to have a better notion of what kind of a person this or that lady is. The ladies with videos hope to make a certain impression on you! They hope to attract your attention to their personality. So, do not hesitate to become closer to our ladies! Use a unique opportunity to watch their video presentations right now. Choose any lady from our Video Catalogue and enjoy watching her video! We are glad to introduce a gorgeous lady Natalia from Nikolaev, who is a splendid example of a real sports lady. Many ladies go in for various kinds of sports nowadays. They mostly attend fitness clubs or gyms. But Natalia can be called unique in this sense. She is fond of football. She is a great football fan as well as a great player. She is glad to reveal her ideas about this hobby and share her exclusive football pictures with you. See her exclusive interview and photos here. We are really glad to admit that there are many talented ladies in BeHappy2Day female catalogue. A lady with ordinary pictures and a common profile can turn out to be a really creative person with a rich inner world. We can proudly say so about one of our ladies Ekaterina from the city of Antratsit, Ukraine. She is glad to let you into her life telling you a bit more about herself and disclosing one of her passions to you. See her exclusive interview and photos here. New and exciting 2-way Live Video Chat is available now! We are happy to announce release of 2-way Live Video Chat! This is a new and exciting feature that allows ladies to see you while using Live Video Chat. Make your on-line conversation absolutely special for your lady: show her your smile and vivid emotions, impress her and make her believe you are the one. Share the most sincere, intimate and astonishing moments while building you relationship with 2-way Live Video Chat! We are happy to announce that our 1000th Live Video Chat occurred last Sunday. In this occasion the lucky couple who participated in this Video chat Jason and Viktoria got a bonus from BeHappy2Day.com. We were glad to present them with free extra 30 minutes of Video Chat. It contributed much into their relations. Live Video Chat service was launched earlier in March at our site and gained its popularity quickly. 86% of our clients admit that Live Video chat is the easiest way to learn as much as possible about your lady as well as to see her. It gives you the idea of how your lady looks like in real life. So, do not hesitate to make the first step for your relations! Learn more here. The major Russian women's holiday is coming very soon! Let us please remind you that the major Russian women's holiday is coming very soon! The 8th of March is an International Women’s Day, it is widely celebrated in Russia and Ukraine; and each lady is in anticipation of this significant holiday. For all the ladies from Russia and Ukraine it has become a national custom to get attention, gifts and compliments from men on this special holiday. Thus we would recommend you not to forget to congratulate your lady and surprise her with a small gift. Traditionally, men present flowers and candies to their ladies. For your convenience we’ve updated Flower & Gift Delivery Service gallery to increase the number of possible gifts for you to choose from. Anyway, if you do not consider pleasing your lady with a gift, do not forget to congratulate her by words and send her your best wishes – she will highly appreciate your attention and care! The 8th of March (Thursday) is an International Women’s Day! Fantastic Live Video Chat is available now! Live Video Chat is an additional option that gives you a thrilling opportunity to see the live video of the lady you are currently chatting in Live Chat with. Thus apart from reading what she writes you being online in Live Chat, you will see her face, smile and reactions! Your online conversation with your favorite lady will become even more touching, intimate and unforgettable! Russia and Ukraine and gorgeous Russian and Ukrainian ladies have stepped into holiday season: New Year and Christmas, the biggest holidays in the above countries, are on its’ way! New Year is the major holiday celebrated on the 31st of December and throughout many years it remains to be a dominating event for everyone in Russia and Ukraine. Holiday dinner is served before midnight and everyone waits to meet a new year. Right at midnight the most important clock in Russia (on Red Square) is shown on TV as it rings 12 times to announce the beginning of a New Year. Another holiday that is no less important and also widely celebrated in Russia and Ukraine is Christmas. It is celebrated on the 7th of January as Russian and Ukrainian citizens are Orthodox Christians. This special day is full of joy and miracle expectations! It is a popular tradition to give presents to everyone who surrounds you on New Year and Christmas. Small or big, a present is a gesture of appreciation and respect. Co-workers, family and friends give gifts to each other and enjoy receiving them. Russian and Ukrainian women take New Year and Christmas holidays especially serious! Being sensual, caring, loving and giving with you all the year round, your best Russian bride will love and appreciate you showing your feelings and attention on this special holiday season! Surprise her by sending a unique gift to let her know how much you care and love her. With behappy2day.com Gift Delivery Service it is easy to bring happiness, bright emotions and million of smiles to your special lady by giving a gift of flowers or box of chocolates. We’ve updated our Gift Delivery Service to include more Christmas gifts and flowers for you to choose from. We will be happy to deliver your warmth, affection and best wishes to your Special One! Merry Christmas and have a great New Year holiday! 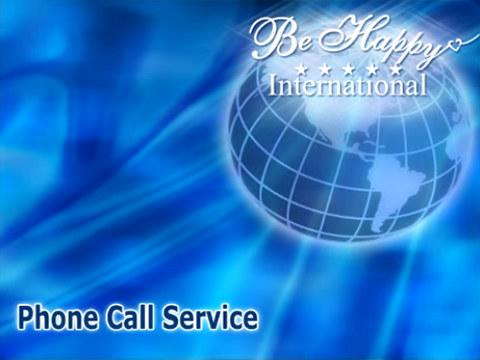 BeHappy2day is glad to announce that its 10,000th 3 way Phone Call was completed on November, 1. Maria and Paul were the lucky couple who participated in this call got extra 30 minutes from BeHappy2day as a gift. Additional time contributed much to the development of their relationship. 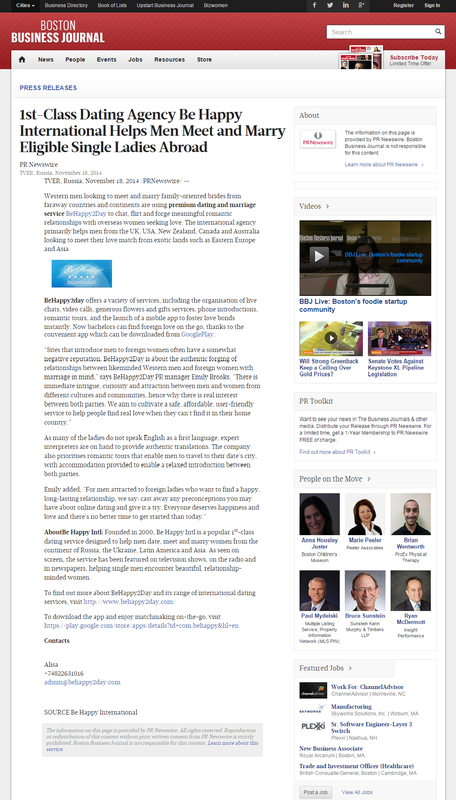 Behappy2day phone call translation service brings people together. It has become a starting point in relations for many of our clients. Many of our customers say that a phone call with a lady can be a good start as well as a really productive continuation for any correspondence. It is the quickest way to exchange both information and emotions that cannot be expressed in one letter. Do not hesitate to make a step to become closer to your lady! Try our phone call service right now! Launching of exciting Live Chat and changes in credit system at BeHappy2day! No action is required on your part, your credit balance will be automatically updated to the new system on 3 Aug.
8 old credits = 80 new credits and etc. As you can see, the new system only increases the number of credits you operate with. The reason why we implement new credit denominations is to accommodate exciting new features like Live Chat and other future improvements to BeHappy website. Live Chat is the newest feature on BeHappy website. Using Live Chat you can chat with any lady who is currently online at BeHappy2day.com website. It allows you to communicate with the ladies in a new and exciting way! Never before you had such an opportunity to meet and get to know new ladies instantly. Interactive nature of a chat will allow you to stand out and to better you chances in making a first impression on a beautiful single lady. Use Live Chat to keep in touch and develop your relationship further with your favorite girl. We match loving hearts! New Success Story here! Irina and Dave found each other with the help of Behappy2day on May 26th, 2011. The agency gave a great support to Irina and Dave in correspondence and also organized their first meeting which led to a developing relationship between two people who were so different at first but became so close at the end. It’s no secret that if you want to win a lady’s heart you have to give her gifts. What do you usually get in return? A little kiss, maybe something more, but it’s something that you can’t use right now. Behappy2day thinks of you and would like to offer you a useful gift. You deserve it and you can use it right away. Just order a gift for your favorite lady and get a gift in return! Here it is. When you place an order for any gift for your lady $50 or more, you will receive 2 FREE credits to your account within 1 business day. If you prefer knocking your lady down with a luxurious present at the sum of more than $ 100 US then you will get 3 FREE credits to your account within 1 business day! Let spring come into your lady’s heart along with you!